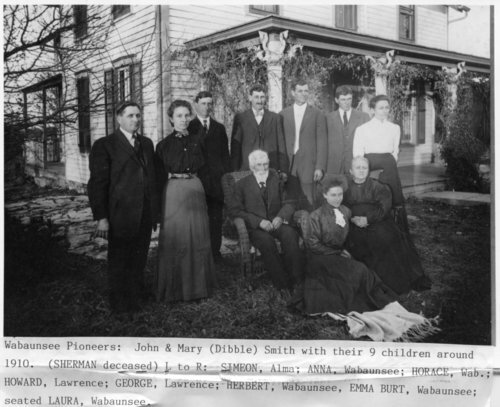 Two photographs of John and Mary Dibble Smith, their children, and grandchildren at a family reunion in Wabaunsee, Kansas. Their children include Sherman (deceased), Simeon, Anna, Horace, Howard, George, Herbert, Emma, and Laura. Others pictured include Sherman's widow, Ida Buzzard Smith Stewart, their twin sons, Charles and Chester Smith, and her second husband Will Stewart; Maude Enlow Smith, wife of Herbert Smith, and their daughters Carolyn and Roberta; Sherman Burt, husband of Emma Smith Burt, and their son Ellsworth; Mae Smith, wife of George Smith; Grace Smith, wife of Howard Smith, and their children Ethey, Elmer, and Cecil; Lois and Blanche Smith, daughters of Simeon; and Zena Zahner Smith.